Sunny Easter days bring to mind Granny’s Coconut Icebox Cake. She made it with a Duncan Hines butter cake mix, Coco Lopez cream of coconut, Cool Whip topping, and Bird’s Eye Tropic Isle fresh frozen flake grated coconut. Of course, I prefer making things from scratch, so I’m sharing both ways here to make this yummy dessert. 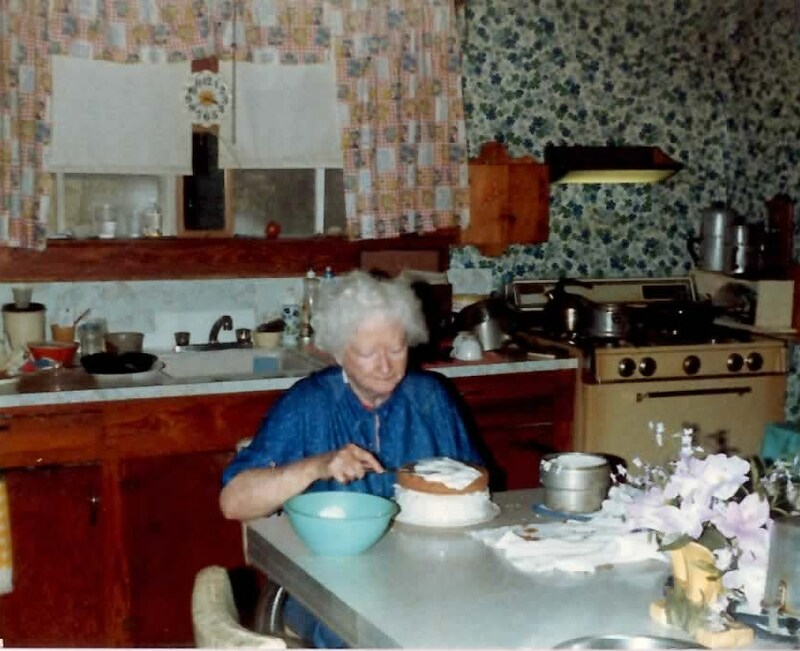 Granny Dee icing a layered coconut cake. Cream butter and sugar for a least 10 minutes. Sift flour, baking powder and salt together. Take turns adding milk and flour to creamed mixture. Beat in 1 egg at a time. Add vanilla. Pour into a greased and floured 13 x 9 x 2 inch pan. Bake on 350 degrees for 30 to 40 minutes or until toothpick comes out clean. Once cake is out of the oven and still hot, poke holes in the top with a fork and pour the cream of coconut over the cake. Let it cool. Once cooled top with whipped topping and sprinkle frozen coconut on top. Refrigerate at least overnight. This dessert is still great a few days later too…moist, cool and refreshing. Enjoy!